This is the fourth and final part of the series of extracts from the book Plentiful Energy — The story of the Integral Fast Reactor by Chuck Till and Yoon Chang. Reproduced with permission of the authors, these sections describe and justify some of the key design choices that went into the making the IFR a different — and highly successful — approach to fast neutron reactor technology and its associated fuel recycling. These excerpts not only provide a fascinating insight into a truly sustainable form nuclear power; they also provide excellent reference material for refuting many of the spurious claims on the internet about IFR by people who don’t understand (or choose to wilfully misrepresent) this critically important technology. Part 1 (metal fuels and plutonium). Part 2 (coolant choice and reactor configuration). Part 3 (lessons learned from fast reactor capital costs). This last extract considers the cost differences and similarities between the next-generation IFR and the current generation of thermal reactors (using a comparison with a generic LWR). Note that this section does not include the costs of fuel (mining, enrichment, fabrication, recycling, and so on). That is, however covered later in the book:, with full fuel-cycle cost estimate being: LWR = 0.55 c/kWh at current uranium cost (Table 13-4) and IFR 0.44 c/kWh — or $35 million/GWyr (Table 13-9). This section is drawn from pages 277-280 of Plentiful Energy. To buy the book ($18 US) and get the full story, go to Amazon or CreateSpace. (Note that the images below do not come from the book). Comparison of fast reactor capital cost with the capital cost of commercial LWRs is not straightforward either. First, the part that should be straightforward, that of identifying the capital cost of commercial reactors, isn’t straightforward at all. U.S. LWRs were built twenty or more years ago, under wildly varying construction environments, some prior to the anti-nuclear campaigns of cost increases, some during the height of them, and a few after. Comparisons between PWR, BWR, heavy water reactors, and gas-cooled reactors are not straightforward either, even though, with the water reactor types, we are dealing with actual experience. Comparison with yet-to-be-designed fast reactors involves more uncertainty. However, the details of the makeup of capital costs do provide useful insight. The Department of Energy’s Energy Economics Data Base (EEDB) defines a code of accounts for estimating and categorizing such cost components. For illustrative purposes, a reference PWR capital cost breakdown developed for the EEDB is presented in Table 13-2. Since the database was generated in the 1980s, the absolute dollar amounts have little relevance to today, so the cost breakdown is expressed in terms of percentage of the total direct costs. This is the third of a four-part series of extracts from the book Plentiful Energy — The story of the Integral Fast Reactor by Chuck Till and Yoon Chang. 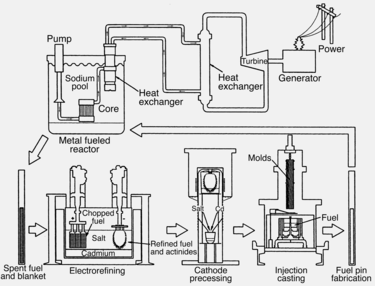 Click here for part 1 (metal fuels and plutonium). Click here for part 2 (coolant choice and reactor configuration). The third extract looks at the history of costs for commercial fast reactors to date (e.g., Superphenix in France). What can this tell us about the possible future costs of the IFR? (the final part will do a comparison with light water reactors). This section is drawn from pages 274-277 of Plentiful Energy. To buy the book ($18 US) and get the full story, go to Amazon or CreateSpace. (Note that the images below do not come from the book). Fast Reactor Capital Cost: What can be learned from fast reactor construction experience to date? 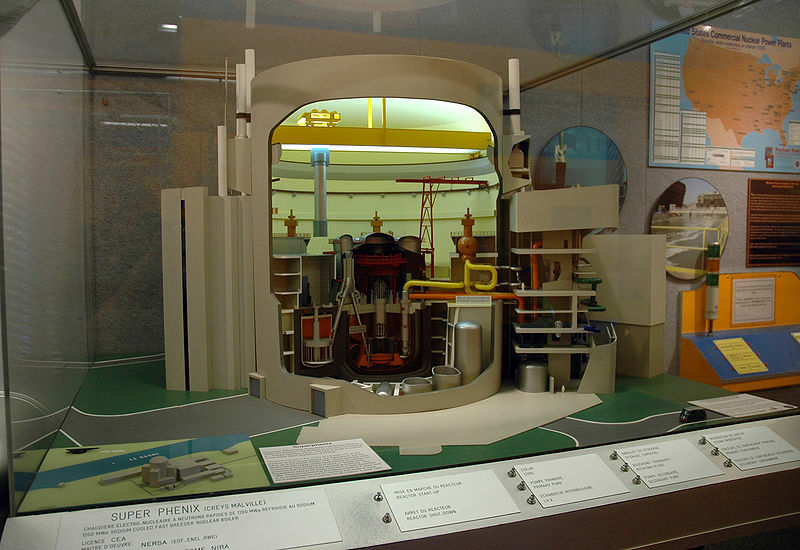 A model of the Superphenix nuclear power station, a now closed fast breeder reactor. While it was open, it was highly controversial and once on the receiving end of a eco-terrorist rocket attack. Some notion of likely cost competitiveness can be gained from past fast reactor construction experience, but the information available is limited. It can be said that the capital costs per MWe of the early fast reactors built around the world were much higher than those of LWRs. But the comparisons are not by any means direct and unambiguous. In comparison to the LWR, every difference between the two adds a cost increment to the fast reactor. With one significant exception, they were much smaller in size and electrical capacity than the LWRs built for commercial electricity generation. There were only a few of them. They were built as demonstration plants, by governments underwriting fast reactor development. There was basically one demonstration per country, with no follow-on to take advantage of the experience and lessons learned. Nor were they scaled up and replicated. The LWR had long since passed the stage where first-of-a-kind costs were involved, and had the advantage of economies of scale as well. Further, their purpose was commercial, with the attendant incentive to keep costs down. None of this has applied to fast reactors built to the present time. Experience with thermal reactor types, as well as other large-scale construction, has shown that capital cost reduction follows naturally through a series of demonstration plants of increasing size once feasibility is proven. This has been true in every country, with exceptions only in the periods when construction undergoes lengthy delays due to organized anti-nuclear legal challenges. But this phased approach of multiple demonstration plants is no longer likely to be affordable, and in any case, with the experience worldwide now, it is probably unnecessary for a fast reactor plant today. Estimating the “settled down” capital cost potential is not an easy task without such experience. Nevertheless, as the economic competitiveness of the fast reactor is taken to be a prerequisite to commercial deployment, we do need to understand the capital cost potential of the fast reactor and what factors influence it. This is the second of a four-part series of extracts from the book Plentiful Energy — The story of the Integral Fast Reactor by Chuck Till and Yoon Chang. These excerpts not only provide a fascinating insight into a truly sustainable form nuclear power; they also provide excellent reference material for refuting many of the spurious claims on the internet about IFR by people who don’t understand (or choose to wilfully misrepresent) this critically important technology. Click here for part 1 (metal fuels and plutonium). The second extract, on coolant choice and reactor configuration, comes from pages 108-111 of Plentiful Energy. To buy the book ($18 US) and get the full story, go to Amazon or CreateSpace. (Note that the images below do not come from the book). 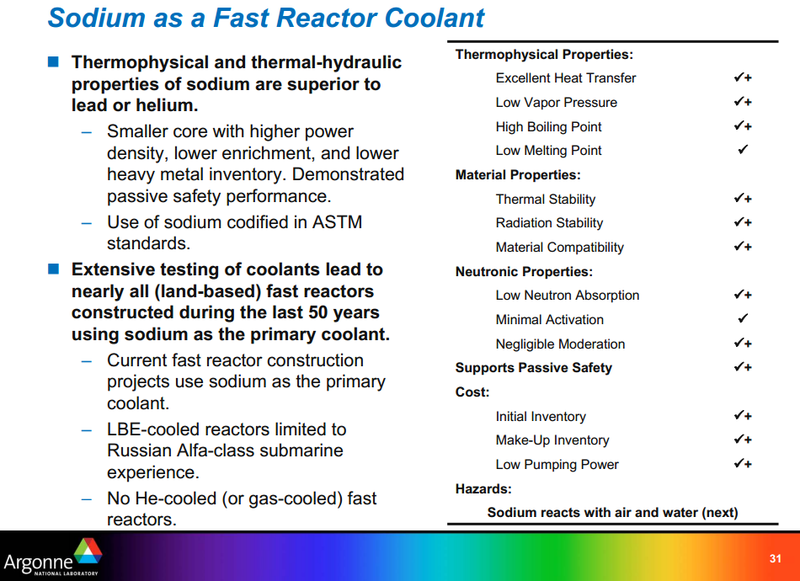 Liquid sodium was the choice of coolant from the beginnings of fast reactor development, because the neutron energies must remain high for good breeding and sodium doesn’t slow the neutrons significantly. (Water does, and so nullifies breeding.) But sodium has other highly desirable properties too—it transfers heat easily and removes heat from the fuel quickly; it has a high heat capacity which allows it to absorb significant heat without excessive temperature rise; its boiling point is far too high for it to boil at operating temperatures, and importantly, even to boil at temperatures well above operating; and finally, although a solid at room temperature, it has a low enough melting point to stay liquid at temperatures not too far above that. In addition, there is no chemical reaction at all between the sodium and the structural materials making up the core (such as steel and zirconium). It is chemically stable, stable at high temperatures, stable under irradiation, cheap, and commonly available. Further, as a metal, sodium does not react at all with metal fuel either, so there is no fuel/coolant interaction as there is for oxide fuel exposed to sodium. In oxide fuel, if the cladding develops a breach such reactions can form reaction products which are larger in volume than the original oxide. They can continue to open the breach, expel reacted product, and could possibly block the coolant channel and lead to further problems. Metal fuel eliminates this concern. For ease of reactor operation, sodium coolant has one supreme advantage. Liquid at room pressures, it allows the reactor to operate at atmospheric pressure. This has many advantages. Water as a coolant needs very high pressures to keep it liquid at operating temperatures. A thousand- to two-thousand-psi pressure must be maintained, depending on the reactor design. 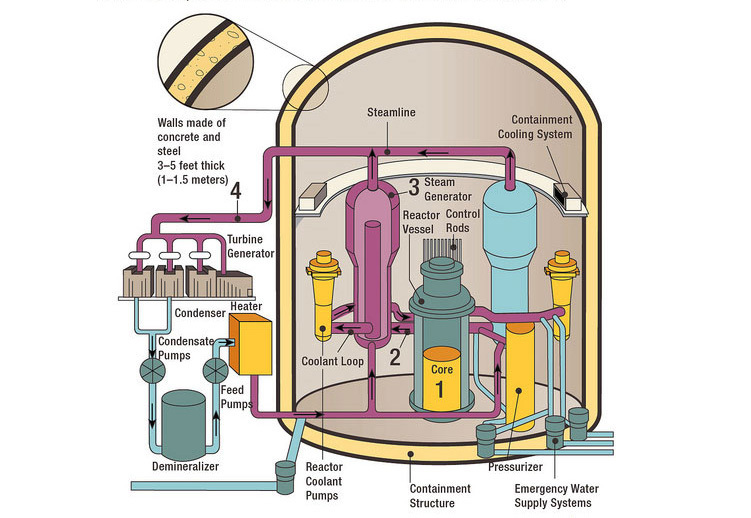 Thick-walled reactor vessels are needed to contain the reactor core with coolant at these pressures. The diameter of the vessel must be kept as small as possible, as the wall thickness necessary increases directly with diameter. With the room-pressure operation of sodium coolant, the reactor vessel, or reactor tank as it is called, can be any diameter at all; there is no pressure to contain. And leaks of sodium, if they happen, have no pressure behind them, they drip out into the atmosphere, where generally they are noticed as a wisp of smoke. The important thing is that there is no explosive flashing to steam as there is when water at high pressure and temperature finds a leakage path. Over the next month or two, I will publish four extracts from the book Plentiful Energy — The story of the Integral Fast Reactor by Chuck Till and Yoon Chang. The first extract, on Fuel Choice, comes from pages 104-108 of Plentiful Energy. To buy the book ($18 US) and get the full story, go to Amazon or CreateSpace. The IFR metal alloy fuel was the single most important development decision. More flows from this than from any other of the choices. It was a controversial choice, as metal fuel had been discarded worldwide in the early sixties and forgotten. Long irradiation times in the reactor are essential, particularly if reprocessing of the fuel is expensive, yet the metal fuel of the 1960s would not withstand any more than moderate irradiation. Ceramic fuel, on the other hand, would. Oxide, a ceramic fuel developed for commercial water-cooled reactors, had been adopted for breeder reactors in every breeder program in the world. It is fully developed and it remains today the de facto reference fuel type for fast reactors elsewhere in the world. It is known. Its advantages and disadvantages in a sodium-cooled fast reactor are well established. Why then was metallic fuel the choice for the IFR? In reactor operation, reactor safety, fuel recycling, and waste product—indeed, in every important element of a complete fast reactor system—it seemed to us that metallic fuel allowed tangible improvement. Such improvements would lead to cost reduction and to improved economics. Apprehension that the fast reactor and its associated fuel cycle would not be economic had always clouded fast reactor development. Sharp improvements in the economics might be possible if a metal fuel could be made to behave under the temperature and radiation conditions in a fast reactor. Not just any metal fuel, but one that contained the amounts of plutonium needed for reactor operation on recycled fuel. Discoveries at Argonne suggested it might be possible. Metal fuel allows the highest breeding of any possible fuel. High breeding means fuel supplies can be expanded easily, maintained at a constant level, or decreased at will. Metal fuel and liquid sodium, the coolant, also a metal, do not react at all. Breaches or holes in the fuel cladding, important in oxide, don’t matter greatly with metal fuel; operation can in fact continue with impunity. The mechanisms for fuel cladding failure were now understood too, and very long irradiations had become possible. Heat transfers easily too. Very little heat is stored in the fuel. (Stored heat exacerbates accidents.) Metal couldn’t be easier to fabricate: it’s simple to cast and it’s cheap. The care that must be taken and the many steps needed in oxide fuel fabrication are replaced by a very few simple steps, all amenable to robotic equipment. And spent metal fuel can be processed with much cheaper techniques. Finally, the product fuel remains highly radioactive, a poor choice for weapons in any case, and dangerous to handle except remotely. 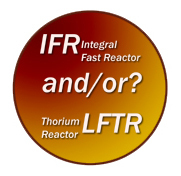 The focus of this series (IFR FaD) is aimed squarely at the Integral Fast Reactor (IFR) rather than other Gen IV designs, such as the Liquid Fluoride Thorium Reactor (LFTR) or Advanced High Temperature Reactor (AHTR). The reason for this is two fold: (i) I’m more familiar with the IFR technology (and I am in regular email exchange with the world experts on this technology, via SCGI and other links), and (ii) LFTR has a strong and welcoming advocacy group elsewhere, and I’d encourage people to go there to ask more questions about that technology … However, I should make it quite clear that I’m not “for IFR and against LFTR” — both 4th generation nuclear designs hold great appeal to me, and I will sometimes consider IFR vs LFTR comparisons in the IFR FaD series, as a point of comparison or contrast. I think we need to be pursuing the final stages of research, development and commercial-scale deployment of all of these next-generation fission technologies, since it would require such a trivial input compared to the huge investment that will be required anyway in energy infrastructure over the next few decades (>$26 trillion globally by 2030). However, it is nevertheless useful to consider the relative merits of the individual technologies, and I hope to look at this from a number of angles in blog posts during 2012. For some initial ideas and to initiate discussion, below I reproduce an email exchange on this matter, including aspects of commercial readiness, that was recently posted on the Science Council for Global Initiatives website. The conversation is from three highly experienced nuclear physicists/engineers, Dr George Stanford, Dr Dan Meneley, and Prof. Per Peterson. I’m sure this will stir some debate! (And, as I said, I will have more to post on this in the new year). I have also added a few hyperlinks to clarify terms that may be unfamiliar to the general reader; please note that the links and pictures were added by me (Barry Brook), not the original correspondents. We’ll see what others on this list have to say, but in my opinion, Carlsen’s enthusiasm for thorium is premature, to say the least. The ONLY significant advantage a thorium cycle would have over fast reactors with metallic fuel (IFR/PRISM) is its lower requirement for start up fissile. That advantage is offset by the fact that the thorium reactor is at a stage of development roughly equivalent to where the IFR was in 1975 — a promising idea with a lot of R&D needed to before it’s ready for a commercial demonstration — which puts its deployment about 20 years behind what could be the IFR’s schedule. 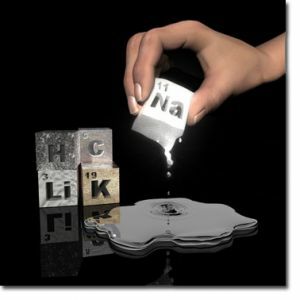 The thorium community has not yet even agreed on what will be the optimum thorium technology to pursue.